Thomas Morton Black, the Kilmarnock-born and well-respected Surveyor of Taxes Dundee (1858 - 1877) before becoming Surveyor of Taxes Hamilton (1877 - 1882). Took an interest in the Dundee Public Library and its amalgamation with the library in the Albert Institute. Beatrice E. b.1864; Alice b.1866; Emily Mary b.1869; Florence b.1871; Frederick Morton b.1875. 37 Albert Court, Dundee (which is listed in census as 202 Nethergate, Albert Court) 1858/59. 5 Craigie Terrace, Dundee, 1867/68. 5 Westfield Avenue, Dundee, 1868/70. Encliffe, West Ferry (now 45 Albany Road), by June 1874. Dundee Bowling Club. Dundee Public Library. Surveyor of Taxes. Valuation officer for Burgh of Dundee. Voting Registration Officer for Forfarshire. Subscriber no.186 – Pattullo and Thornton– Thomas Thornton handled appeals against his assessments. Subscriber no.258 – James Yeaman – Black was in attendance at his testimonial dinner. 6 High Street, Dundee, 1861/62. 30 Reform Street, Dundee, 1867/68. 12 Bank Street, Dundee, 1868/70. 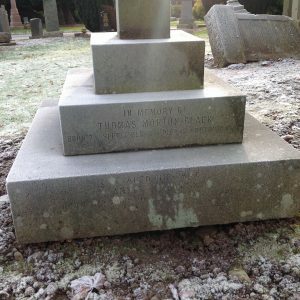 Thomas Morton Black was born on 7 September 1831 in Kilmarnock to James Black and Barbara Gemmel. His father was described as an engineer on the 1841 census and as “gentleman” on his son’s marriage certificate in 1863 - presumably because he had retired by then. He was the fifth of six children and the third son. He lived in Kilmarnock at least until the age of 9, (as he appears in the 1841 census) but by 1846 the family appear to have moved from there as there is no reference to them in the Kilmarnock Post Office Directory for 1846-47. It has not been possible to discover where they went as neither Thomas nor his father can be traced through census records. During this time, he will have been training as a surveyor of taxes and valuer. In the Dundee Advertiser’s report of valuation appeals in 1866, he asserted that he had twenty-five years’ experience of valuation. As he was 35 years old at the time this is an exaggeration but it suggests that he spent his whole career in valuation and taxation. Thomas next appears in Dundee in 1858 where he is Surveyor of Taxes, a post which he was to hold in Dundee for the next twenty years before moving to a similar position in Hamilton. On 9 March 1863, Thomas, then 30 years old, married 18-year-old Annie Nichol of Sheffield in the Talbot Street Methodist Chapel, Sheffield. The absence of any information about him between 1841 and 1857 presents a puzzle as to how a man born and, at least partly, brought up in the West of Scotland, and for five years before marriage living and working in Dundee, came to meet and marry a girl from Sheffield. Unfortunately, at the date of the 1861 census Annie Black was visiting a house thought to be near the address on her marriage certificate, so very little is known of her circumstances at the time. The census records her status as “visitor”. The couple took up residence in Dundee. Thomas, when he had come first to Dundee, had lodged at 37 Albert Court (which is listed in the census as 202 Nethergate, Albert Court). By 1861 he had moved to 37 Nethergate where it seems likely that he started married life. By 1867 he had moved to 5 Craigie Terrace on the Broughty Ferry Road between the junctions of Murray Street and Dalgleish Street, and by 1868 to 5 Westfield Avenue just off the Perth Road where he was still living at the date of the 1871 census. In late 1873 he is on the move again and leases out the Westfield Avenue house and purchases Encliffe, a house which now has an address on Albany Road, West Ferry. This was a house with five bedrooms and three public rooms set in almost an acre of “…grounds that are tastefully laid out as lawns, shrubberies and kitchen garden.” The sale was by public roup with an upset price of £2,500 (nominal value at 2018: Relative to income £2,000,000). Here they lived until Thomas was transferred to Hamilton -where they lived at Woodcroft, Townhead Street, Hamilton. In Dundee Thomas seems to have played a part in social life. He was on the committee of Dundee Bowling Club and, one may suppose, played there for several seasons. He also took an interest in Dundee Public Library and, on 21 January 1870, chaired a meeting of its proprietors to consider transferring it to the Free Library. Further, on 24 August that year, he contributed to the discussion at a meeting of the subscribers to the Public Library, called to consider its winding up. It would seem that he was a popular and gregarious figure to judge by the number of invitations to public events that he received. He was one of the gentlemen invited on the inaugural trip of the Harbour Commissioners’ new tug on Saturday 4 March 1871; he was one of the “influential citizens” present on 26 September 1872 at a Testimonial to Provost Yeaman; he attended a dinner to celebrate the appointment of Mr. Alex. Menzies as Rector of Webster’s Seminary, Kirriemuir (now Webster’s Academy); was present in the Town Hall at a dinner to celebrate the marriage of the Duke of Edinburgh; and at receptions in the Town Hall to mark the Queen’s birthday on 20 May 1874, 19 May 1874, and 17 May 1876. In addition, he attended a dinner to welcome the Prime Minister of Canada on 15 July 1875, and on 26 August 1875 he was at a farewell dinner for Rev James Mackay who was moving from Dundee to a charge in Brechin. Nothing is known of Thomas Black’s professional career until he appears in Dundee in 1858 on his appointment as surveyor of taxes in succession to Mr. James Jack who had retired. In addition to this office he was also appointed as valuer under the rating legislation for Dundee -which at times resulted in his involvement in public controversy. On 25 January 1866, the town council considered a sub-committee report on valuations in the burgh and one member at least was critical of his assessments – though others praised his work and he was reappointed for the following year. Later in the year he faced numerous appeals against his rating valuations in Dundee from the large mill owners and the owners of large houses who were represented by the formidable Dundee solicitor Mr. (later Sir Thomas) Thornton. Many of his valuations had significantly increased following a change of policy based on the approach of his Edinburgh colleague and while some valuations were reduced it seems that most were upheld. He had earlier been appointed Assessor under the Registration of County Voters (Scotland) Act for the county of Forfarshire. He died in Hamilton at a house named Wybourne on 12 October 1882. Had the Blacks changed the name from Woodcroft, or was it a different house? The former seems more likely, as Wybourne was the address from which his wife had been married. A report in the Courier states that he died after a comparatively short illness “…from an exceedingly distressful malady,” which his death certificate shows was cancer of the liver. He left a widow and five children (four girls and a boy) aged between 7 and 18 years. Although neither Thomas nor Annie Black was a native of Dundee, they clearly developed an affection for Dundee and put down roots there. Even after they had moved to Hamilton, we find Mrs. Black still involved in the activities of Stephen’s Church, Broughty Ferry. In an advertisement in the Dundee Courier she is listed as one of those who will accept donations for a bazaar to reduce the debt on the new church. Her husband was buried in the Eastern Cemetery (see grave stone photo) where there was a large attendance at his funeral. Most tellingly, she brought her family back to Dundee where they lived at Caenlochan Terrace until she remarried in 1884. Her second husband was a widower, James Procter Kyd, one of the founding partners of Shield & Kyd – until recently (2012) a prominent firm of solicitors in Dundee. Frederick Morton Black – Born: 19 June 1874 (see Courier notice 23 June 1874) – Died: at Bombay 16 January 1913 aged 38 (see headstone) and intestacy record on ScotlandsPeople. See photo of grave in the Eastern Cemetery, Dundee in the Image Gallery. 1881 Census Scotland. Hamilton. ED: 17; P.5; Line: 22; Roll: cssct1881_260, Ancestry website. England & Wales Marriage Registration Index. 1st quarter 1863. Sheffield Registration District Vol. 9C, p.466 line 31. Ancestry website. Dundee Directory, 1858/59, p.107. Local Studies, Central Library, Dundee. Dundee Directory 1861/62, p.117. Local Studies, Central Library, Dundee. Dundee Directory 1867/68, p.100. Local Studies, Central Library, Dundee. Dundee Directory 1869/70, p.317. Local Studies, Central Library, Dundee. Dundee Courier, 23 June 1874. Birth notice. British Newspaper Archive website. Statutory Register. Hamilton. Death. 12 October 1882. 647/424. ScotlandsPeople website. Dundee Advertiser, 26 October 1865, p.3 and 27 October 1865, p.2. British Newspaper Archive website. Dundee Advertiser, 21 April 1864, p.4. British Newspaper Archive website. Dundee Courier, 25 September 1866, p.5. British Newspaper Archive website. Dundee Advertiser, 28 August 1861, pp.2 and 3. British Newspaper Archive website. 1861 England & Wales Census. Registration District of Sheffield, sub-district Sheffield Park, Folio 110 p.18. Ancestry website. [Dundee Courier & Argus, Friday, 7 November 1873, p.1. British Newspaper Archive website. Dundee Courier & Argus & Northern Warder, Tuesday, 6 February 1877, p.1. Sale advertisement. British Newspaper Archive website. Dundee Courier & Argus and Northern Warder, Friday, 2 March 1877, p.1. British Newspaper Archive website. Naismith's Hamilton Directory, 1878/79, p.28. National Library of Scotland website. Dundee Courier & Argus, Thursday, 25 August 1870. British Newspaper Archive website. Dundee Advertiser, Monday, 6 March 1871, p.3. British Newspaper Archive website. Dundee Courier & Argus, Friday, 27 September 1872, p.2. British Newspaper Archive website. Dundee Courier & Argus, Monday, 6 October 1873, p.3. British Newspaper Archive website. Dundee Courier & Argus, Friday, 7 November 1873. British Newspaper Archive website. Dundee Courier & Argus, 21 May 1874, p.2; 20 May 1875, p.2 and 18 May 1876, p.2. British Newspaper Archive website. Dundee Courier & Argus and Northern Warder, Friday, 16 July 1875, p.2. British Newspaper Archive website. Dundee Courier & Argus and Northern Warder, Friday, 27 August 1875, p.2. British Newspaper Archive website. Dundee Courier & Argus and Northern Warder, Friday, 13 October 1882, p4. British Newspaper Archive website and Dundee Directory 1858/59, p.107. Local Studies, Central Library, Dundee. Dundee Advertiser, 13 October 1882, p.5. British Newspaper Archive website. Lamb Collection. 215(2). Local Studies, Central Library, Dundee. Dundee Advertiser, Friday, 13 October 1882 p.5. British Newspaper Archive website. Dundee Courier & Argus, Monday, 8 September 1879, p1. British Newspaper Archive website. Dundee Courier & Argus and Northern Warder, Tuesday, 17 October 1882. British Newspaper Archive website. Statutory Register. St. Andrew, Edinburgh. Marriage. 1884. 685/2 334 p.167. ScotlandsPeople website. Wills and Testaments. Glasgow Sheriff Court Inventories. Sc536/48/100 p.531 and p.538. ScotlandsPeople website. Wills and Testaments. Glasgow Sheriff Court Wills. SC36/81/55. Glasgow Sheriff Court Wills p.177. ScotlandsPeople website. The law had recently been changed to permit heritable property (land and buildings) to be dealt with by will. As was still common practice, this will did not do so, and we do not know to whom it was bequeathed. The information above about Thomas Morton Black has been collated from a range of digital and hard copy sources. To the best of our knowledge it is correct but if you are relying on any information from our website for the purpose of your own research we would advise you to follow up the sources to your own satisfaction. If you are aware of an inaccuracy in our text please do not hesitate to notify us through our Contact page.